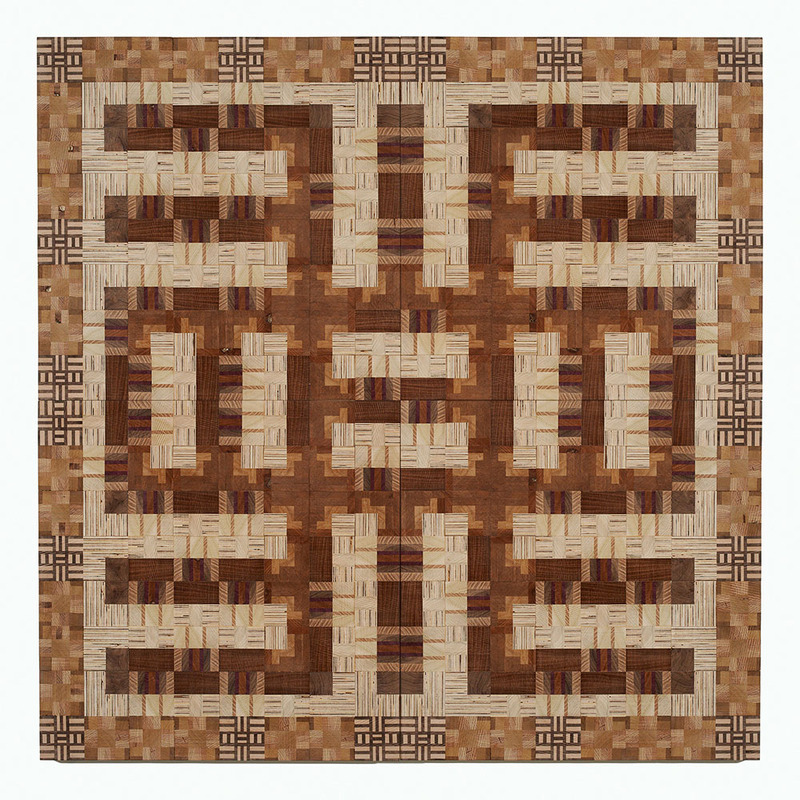 White contains all wavelengths of visible light, and in turn humans have deposited within it our multitudes of meanings, reflecting opposing and essential facets of human experience. 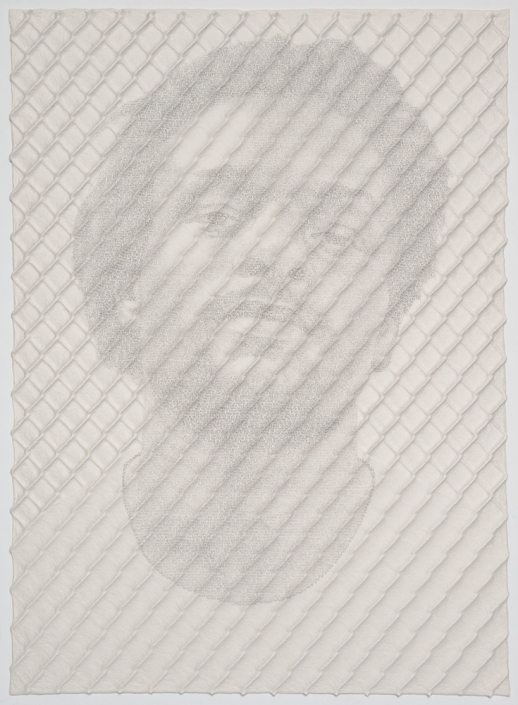 Inspired in part by James Baldwin’s observation that “Color is not a human or a personal reality; it is a political reality,” Subversive White presents a response to a specific strain of white that has permeated our national dialogue: the ugly, enduring premise of white supremacy and the host of oppressive systems that it engenders and enables. 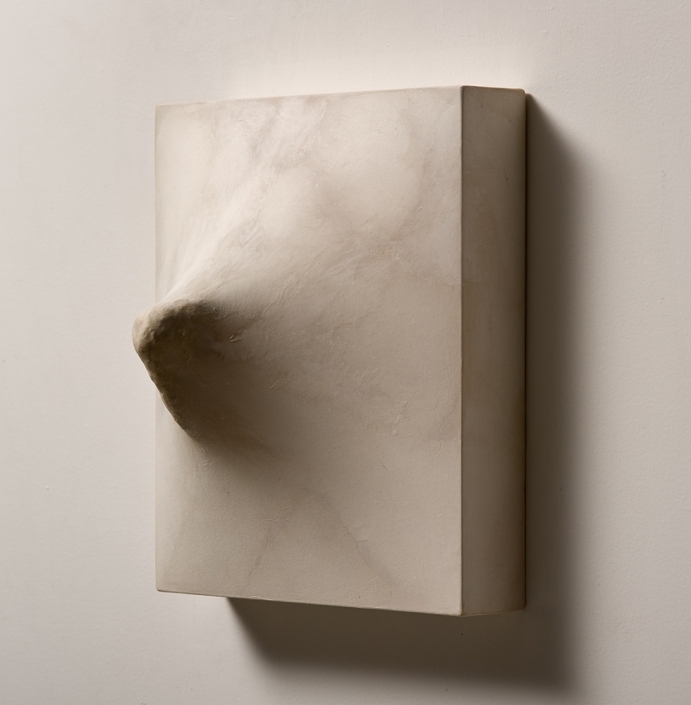 The artists included in Subversive White pull at the veil of whiteness, investigate the tendency of white to imply both beauty and menace, take aim at the false notions of ethnicity and biology, and the presumed opacity of white and its ability to cover, obscure, or erase. Throughout the show, white reemerges as a purifying flash of light and heat, a conflagration with the potential to reveal the phantasms within. 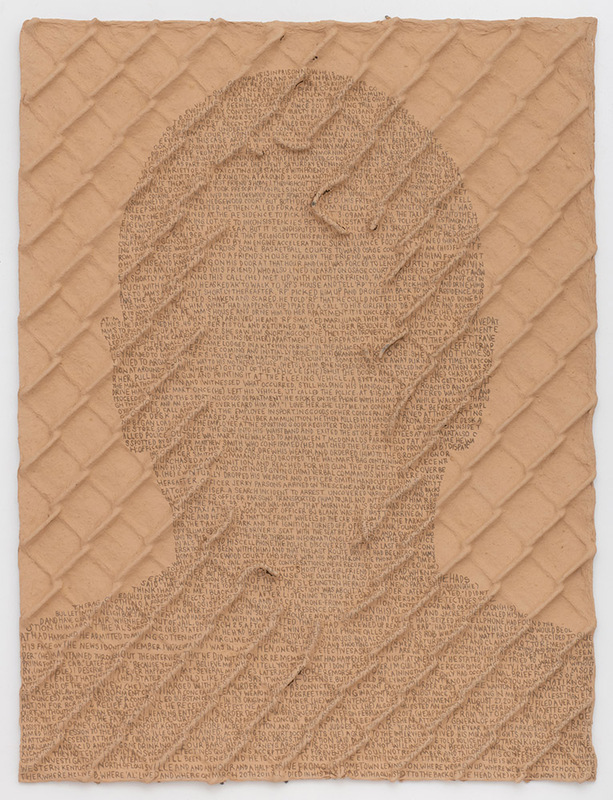 Artists include: Enrique Chagoya, Sonya Clark, Claudio Dicochea, Ben Durham, Angela Ellsworth, Rob Kinmonth, Carrie Marill, Trina McKillen, Mark Mitchell, Ann Morton, Fiona Pardington, Ato Ribeiro, Julianne Swartz, and Hank Willis Thomas. 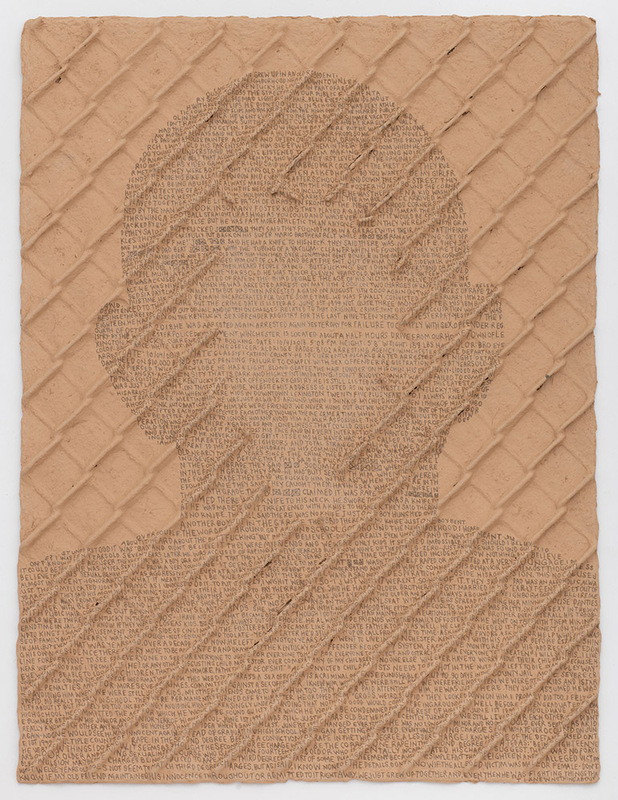 The painter Claudio Dicochea employs the format of 18th century Latin American Casta paintings—diagramatic schemes depicting Colonial family units, from the palest-complected to darkest—but substitutes archetypal figures from comics, science fiction, cinema and popular culture in a riot of associations connecting us all in a common generative flux. 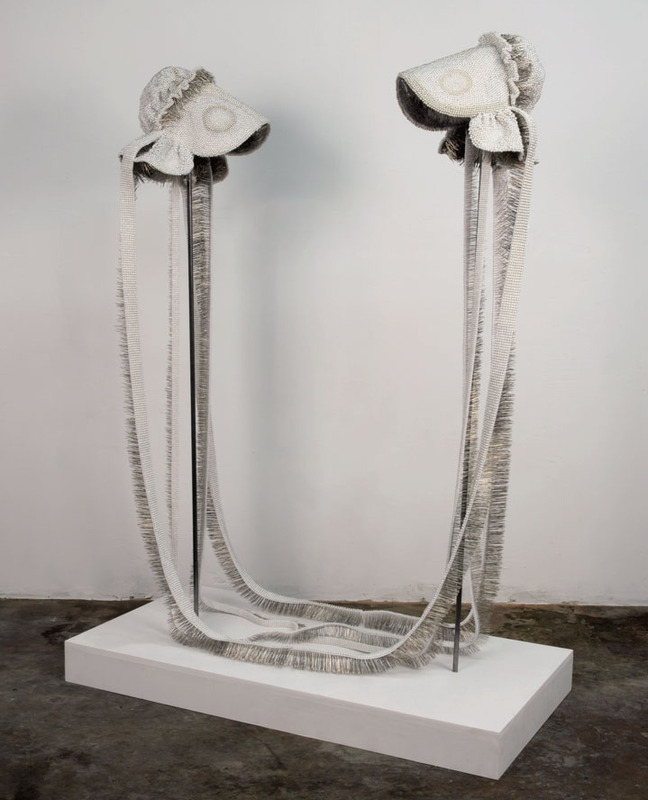 Dicochea’s 081217 is stark and wraithlike, referencing the date of the 2017 “Unite the Right” white supremacist rally held in Charlottesville, Virginia. Dicochea cross-breeds three iconic automobiles: the 1917 Ford Model T, 1969 Dodge Charger, 2010 Dodge Challenger, and explains his haunting family portrait in this way: “The bottom portion is the vertically compressed 2010 Dodge Challenger, after it was used to maul peaceful demonstrators at the Charlottesville rally. The driver injured 19 people and killed 32-year-old Heather D. Heyer. The Dodge Challenger is the updated version of the Dodge Charger, which was a model made famous by the television series The Dukes of Hazzard, which ran on CBS from 1979 to 1985. The vehicle is more famously known as the “General Lee,” an enduring symbol of Confederate pride. It is named after general Robert E. Lee, who himself was born less than two hours from Charlottesville. The top is a Ford Model T, which was produced on August 12, 1908. This was the first automobile to make full use of Henry Ford’s famous factory line production method and was intended to generate a mass consumer market for automobiles in the US.” Dicochea depicts the embrace of American consumerism and American racism, an intertwined history of violence and coercion that has given rise to this ghastly present-day progeny. 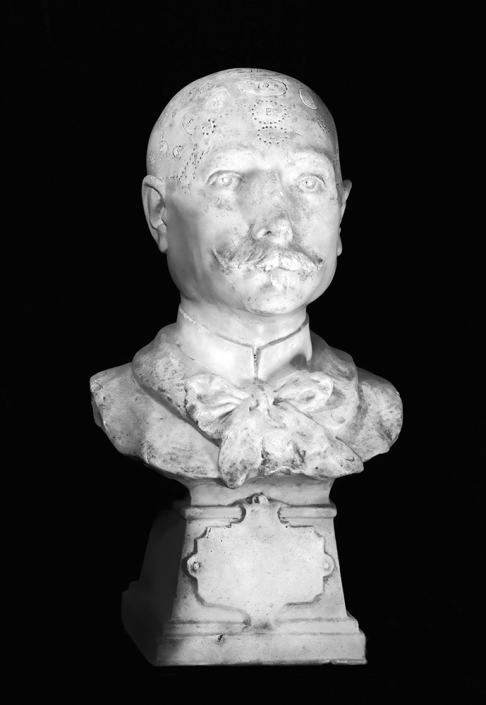 The photographer Fiona Pardington addresses generations of racist pseudoscience in Phrenology Head, Le Kremlin-Bicêtre Hospital, Paris 2011 (With thanks Musée de l’Homme (Muséum National d’Histoire Naturelle), Paris), a striking portrait of a 19th Century phrenological bust. A system of cranial measurement that supposedly corresponded to character traits, or “mind organs,” phrenology was primarily a method to justify pervasive and immoral notions of ethnic superiority. 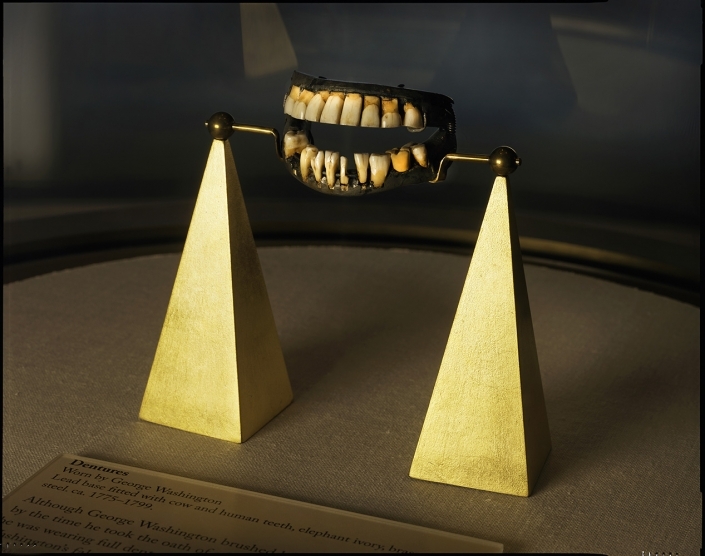 Pardington, a native of New Zealand who scours cultural institutions for these obsolete medical models, found this pale, mustachioed visage abandoned “in the car park storage of Paris’s Kremlin-Bicêtre Hospital, along with a group of other casts; they’ve basically been forgotten.” While the models have been discarded, the pernicious habit of generating scientific facts as a rationale for existing biases reaches deeply into our present moment. It’s a form of delusion that is aptly represented in the unblinking eyes and methodically gouged, segmented cranium of the Kremlin-Bicêtre man. 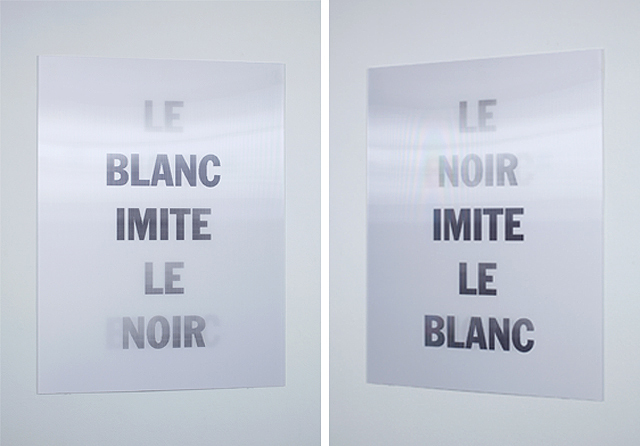 Hank Willis Thomas’ lenticular work, Le Blanc Imite Le Noir, requires that its viewers alter their location and vantage point in order to perceive the work, as the image shifts and the text changes. 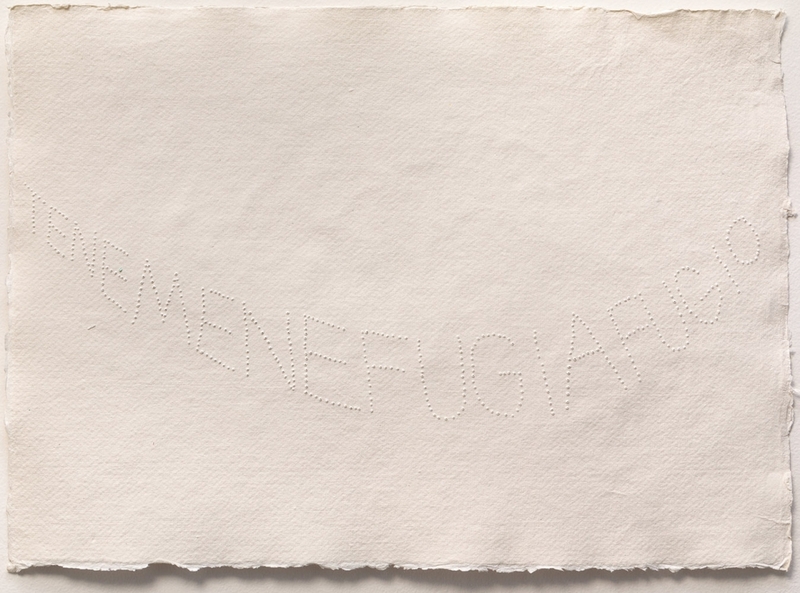 The piece is simple at first glance—black text on a white background. Yet no single view grants access to the sum of the composition; its simplicity is a riddle, and the message contained within and projecting from its white lenses is in a constant state of flux. 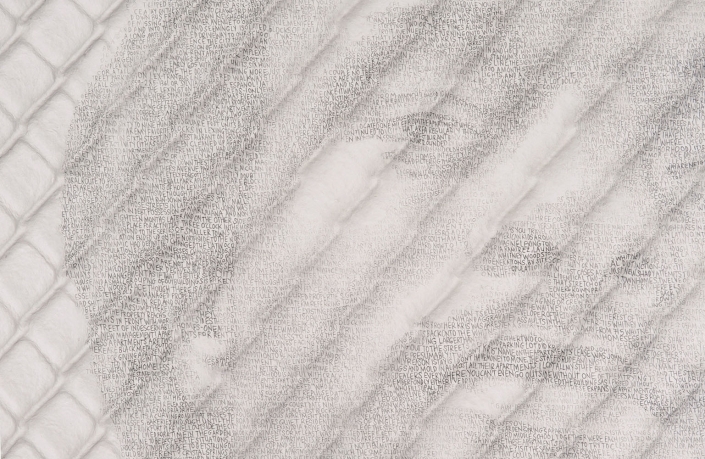 From the insistent protuberance pushing beneath the skin-like surface of Julianne Swartz’s Stretch Drawing (Thick Jut), to The Gaze, Carrie Marill’s still-life in which a chalky, stolid embankment is fractured by blasts of organic growth, white becomes a method of resistance and a cipher; a place where meanings may turn radically below the surface. 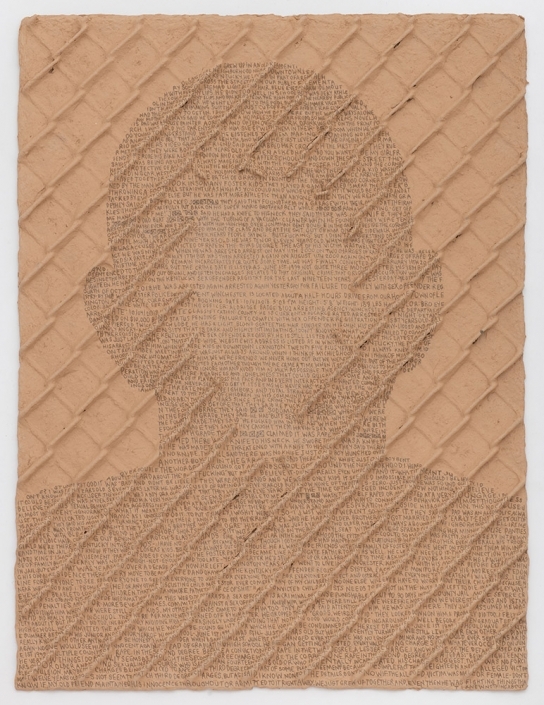 In her Proof-Reading series, Ann Morton’s white handkerchiefs include a disclaimer: a careful inspection will reveal the false claims of purity permeating our current conversation, from the bleached dentition of so-called leaders to the straightjacket of our criminal justice system. 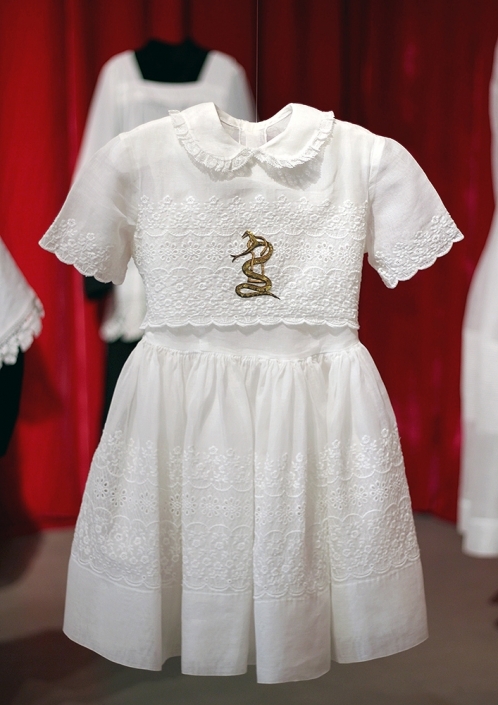 With similarly delicate sensibility and explosive implications, Trina McKillen’s The Children (Communion Dress) is a souvenir of the generations of sexual abuse committed by the Catholic Church, the garment’s symbolic childlike innocence forever connected to the immense perversions of patriarchal power. 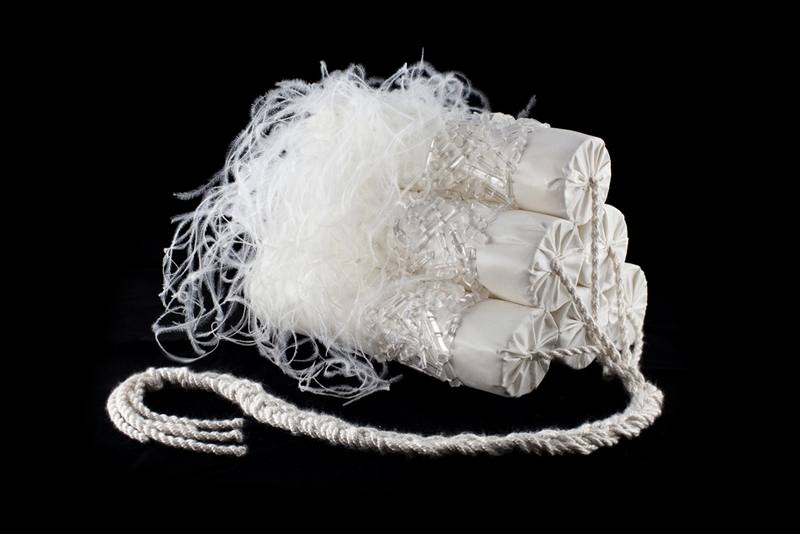 In Subversive White these ritual objects reverse the dynamic of repression and themselves become powerful storytelling objects. 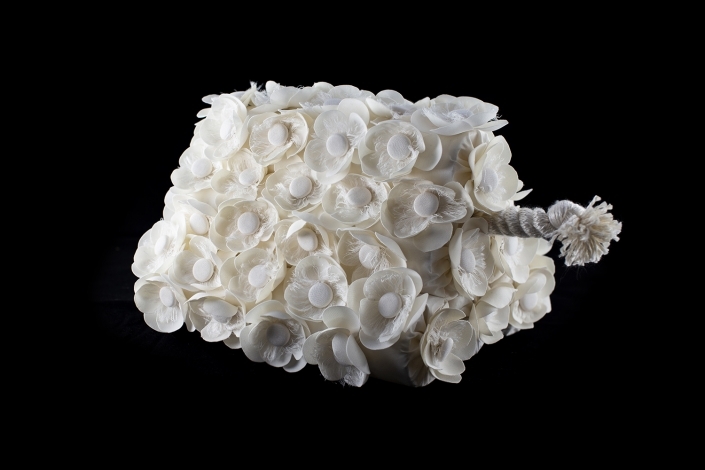 Angela Ellsworth’s intricately patterned Seer Bonnets, head-coverings comprised entirely of pearl-tipped corsage pins, recall the transcendental gatherings of the plural wives of Ellsworth’s traditional Mormon heritage. 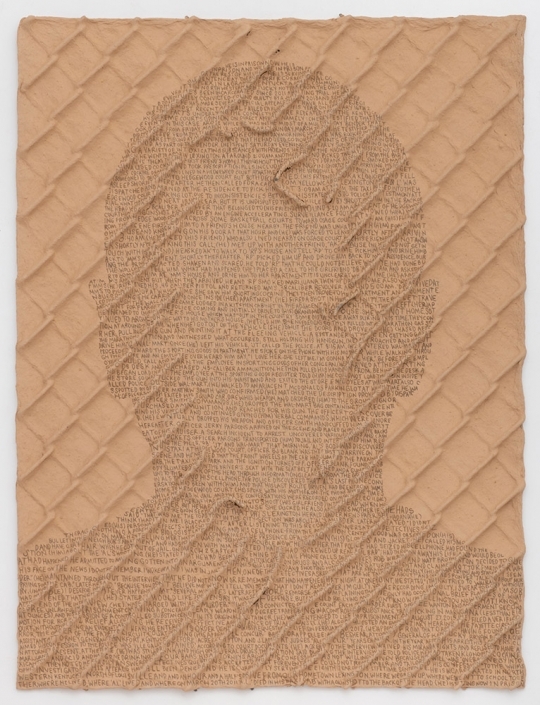 Beyond the censored and officially-sanctioned accounts of history and religion, secret stories are pulsing, forging new forms from the rituals of the past. 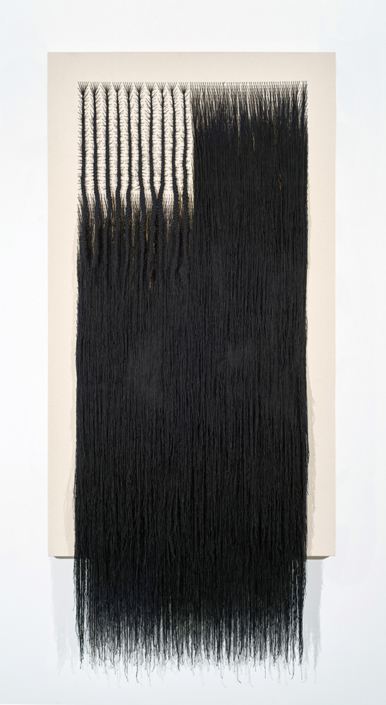 Textile and performance artist Sonya Clark tests the interactions between elementary human materials: textiles and text, storytelling and symbols such as flags, beads and human hair, and fuses stories both universal and personal. 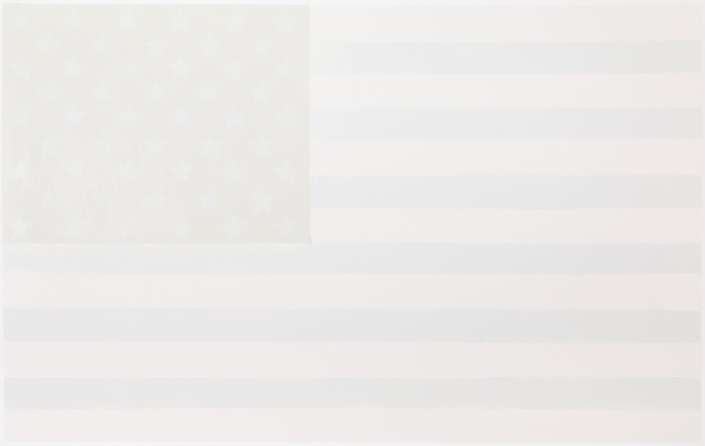 In Whitewashed, tones of Sherman Williams paint (titled with the actual paint colors: Incredible White, Storyteller, and Natural Choice) create the ghostly impression of an American flag, a symbol rendered nearly invisible. The work is remade in each exhibition setting, a continuous bodily investment in this pale version of our country’s banner.